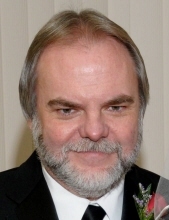 Michael “Mick” James Long, 63, of Tontogany, OH, passed away October 14, 2018 at his home. He was born July 20, 1955 to James and Rose (Chenetski) Long. Mick was a self-employed auto mechanic. He enjoyed working on cars, bowling, playing slots and making things out of wood for his grandkids. He was a jack-of-all trades and also enjoyed watching NASCAR, American Pickers and any shows related to cars. He married Becky (Vollmar) May 14, 1977. She survives along with children, Shawn Long of Bradner, OH and Lacy (Kyle) Kumfer of Defiance, OH, grandchildren Archer Kyle and Ryder Michael Kumfer, sister, Susan Grosjean of Tontogany, OH and half-brother, Ronald Long of Delta, OH. He was preceded in death by his parents. Mick’s Celebration of Life Luncheon is being planned for Sunday, November 25, 2018 at 1:00 p.m. at Tontogany American Legion Post #441. Arrangements have been entrusted to Peinert-Dunn Funeral Home, Tontogany, OH. In lieu of flowers, the family suggests memorial contributions be made to the Sons of the American Legion Post #441, Hospice of Northwest Ohio, or to the family for medical expenses. To leave an online condolence with Mick's family please visit www.dunnfuneralhome.com. To send flowers or a remembrance gift to the family of Michael J. Long, please visit our Tribute Store. A Celebration of Life Luncheon will be held Sunday, November 25, 2018 at 1:00 p.m. at Tontogany American Legion Post #441. "Email Address" would like to share the life celebration of Michael J. Long. Click on the "link" to go to share a favorite memory or leave a condolence message for the family.